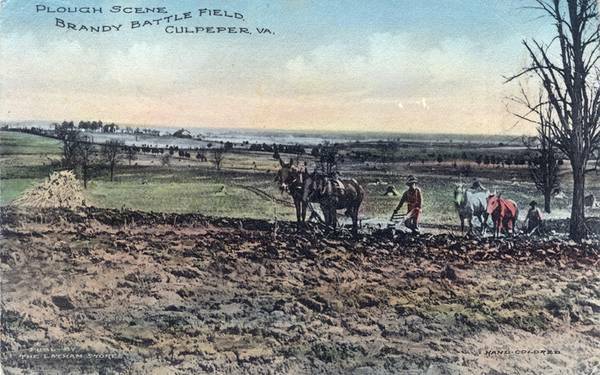 The Battle of Brandy Station, also called the Battle of Fleetwood Hill, was the largest predominantly cavalry engagement of the American Civil War, as well as the largest to take place ever on American soil. It was fought at the beginning of the Gettysburg Campaign by the Union cavalry under Maj. Gen. Alfred Pleasonton against Maj. Gen. J.E.B. Stuart's Confederate cavalry on June 9, 1863. 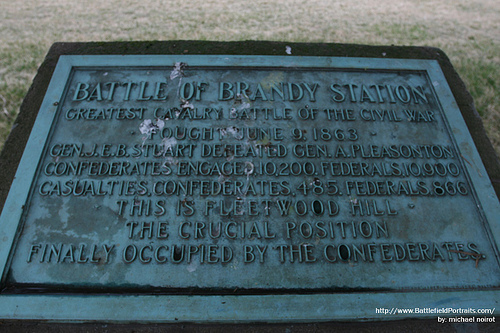 "Battle of Brandy Station." Wikipedia, The Free Encyclopedia. 18 Jul 2009, 21:09 UTC. 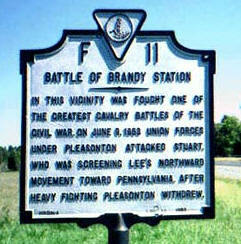 5 Oct 2009 <http://en.wikipedia.org/w/index.php?title=Battle_of_Brandy_Station&oldid=302835191>. Please support the efforts to preserve our history via the Civil War Trust!! !